Chicken chili is a great alternative to beef or pork chili, and with extra vegetables and the beans, it's healthier. This recipe makes a big batch of chicken chili, perfect for a game day party or tailgating. Leftover chili can be frozen, too! Just pack it into airtight freezer containers, label, and freeze it for up to 6 months. 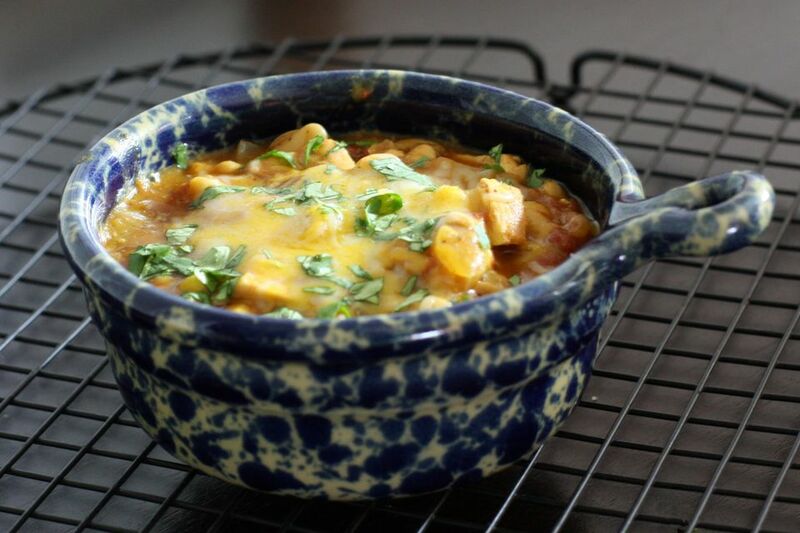 A combination of chicken thighs and chicken breasts make this chicken chili extra-flavorful. Use white beans in the chili. Great northern beans or navy beans are good choices. Top the chili with your sour cream and cilantro or green onions or top it with some shredded cheese. Serve this chicken chili with fresh baked cornbread or crusty rolls. In a large Dutch oven, sauté the chicken pieces in the olive oil over medium heat until lightly browned. Add the onion and continue cooking, stirring, until onion is softened. Add the garlic and bell pepper and continue cooking for 2 minutes. Add the beans, diced tomatoes, salsa, chile peppers, jalapeno peppers, corn, chili powder, cumin, oregano, salt, and pepper. Bring to a boil. Reduce heat to low, cover, and continue cooking for 1 hour. Serve with sour cream, cilantro, and shredded cheese, as desired.